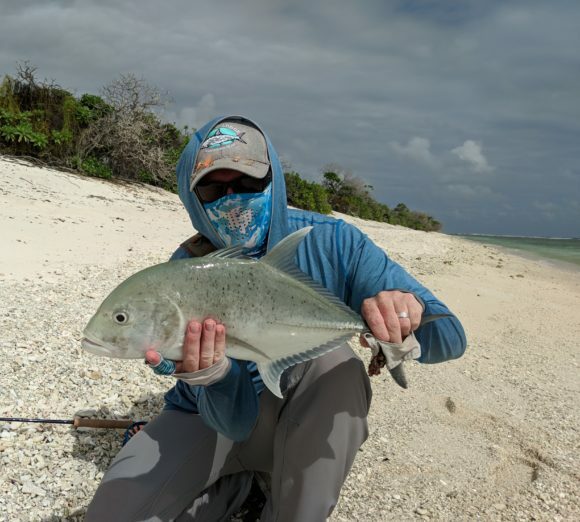 GTs, Geets, Giant Trevally. Everyone wants to know about the GTs of Christmas Island. Everyone who goes there wants to catch one. They are undeniably special and when you look at all the species in a place like Christmas Island, the GT stands out, in relief, and your finger keeps finding them on the page. Yes, I saw some big geets in Xmas. The first one was at the Korean Wreck when a good fish (40#? more?) smashed a bonefish I had just released about 8 feet from where I stood as I was looking the other way. This was right on the shore. Scared the hell out of me (and the guide too). 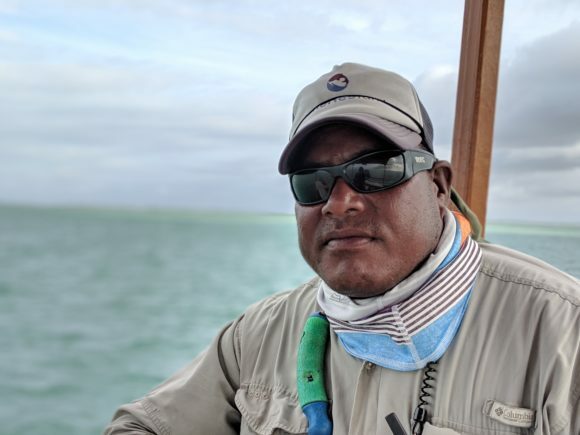 It gave me an impression of just how impressive these fish are and underscored just how precarious is the life of a bonefish. Later that day the guide took me out to one last spot and in a couple of minutes found me a small GT on shore patrol. One cast, a couple strips and he was on. Not a big fish, but a GT. It pulled hard, very hard, and I could imagine what this fish multiplied would feel like. Another, about the same size, came by about 2 minutes after releasing the first fish. Didn’t have my act together enough to get a cast in. The next day I was out at the Wreck again and the first fish we saw was a GT with it’s back out of the water. It wandered off into the breakers and we followed. I put some long bomb casts out into that area just where the breakers do their breaking, but I wasn’t getting any love. The guide told me to reel in and so I put out another cast and was putting the line back on the reel when something kind of magical happened. You’ve seen when the face of a wave becomes a window into what is below the wave? As I reeled in a wave came rolling in and when the face of the wave was in full view I could see my bait fish imitation clearly and I could also see the GT come up and eat it. It was like watching it all happen on a high-def screen. Here’s where I made my GT mistake. When you get a GT in this sort of environment you CAN NOT LET IT RUN. Just where those waves were breaking is a drop off and along the drop off there is pretty much nothing but a bazillion coral heads waiting to snag your line or your tippet and to free that fish from you. You are supposed to immediately crank down your drag and not give one god damned inch to that fish (if possible). The fish was off the edge in a heartbeat and threw the first wrap against the coral a split second after that. I could still feel the fish pulling, but I knew it was in danger. I walked out a bit further to see if I could get it unattached and could see the line come back toward me and wrap on another bit of coral. There, about 20 feet from me, right at the edge of the drop, I could actually see the GT. He wasn’t huge, maybe 20 pounds (25? ), and he was still attached. I walked out a little bit more and picked up the fly line winding from the point it was wrapped to my left to the spot it was wrapped in front of me. That bit of added tension did it. The leader cut on the coral. The fish was free. Fast forward to the last day and the last flat. I was still without a big GT. I don’t think one was actually landed on the trip. Largest might have been about the size I had lost to the coral, but the 40 and 50 and 60 pounders, or those elusive 90 pounders were all un-landed. One guy had lost his whole fly line on a GT when trolling and there were other anglers with other good shots, but nothing in the books. I was fishing with one of the top guides, TK, and we were walking a flat not far from a GT highway. The sky was grey and the light was flat and diffused. I couldn’t see anything in the water at all. At this point I started to wonder if TK was just riding out the last minutes of the trip. I couldn’t imagine you could walk out on a flat like this and find a GT without being able to see in the water. Part of me was also telling me to trust my guide. He was very much searching the water, not going for a stroll. He knew the water and the fish, I didn’t. I should just trust him, right? With time running out and the 10 weight primed in my hands TK pointed at a fast moving bulge of water headed more or less in our direction. “GT!” It was a short cast, maybe 30 feet. I cast ahead of the fish, just beyond his path and when TK told me to strip, I stripped like mad. The fish reacted, veered toward the fly and it all seemed like it was going to happen. Except… the fish then exploded and altered course in a direction distinctly not toward the fly. Maybe it didn’t like the fly. Maybe it didn’t like the strip. Maybe it saw us. I don’t know, but I watched the massive shape displacing a lot of water quickly fade from view. I had the shot. I had a good shot presented by a guide who knew his water and knew his fish and it just didn’t happen.